Marion provides all varieties of expert joint repointing and restoration services. 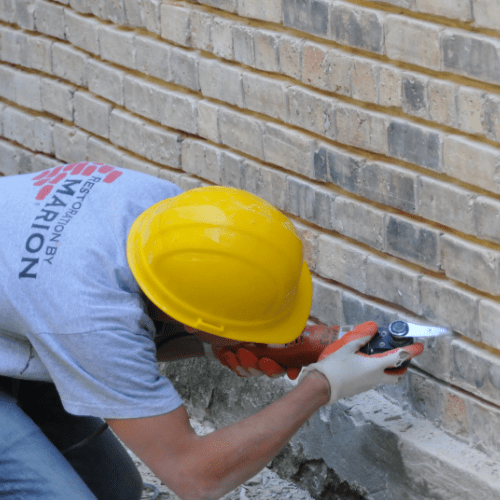 We carefully prepare joints without damaging adjacent masonry units. As a company standard, our crews remove mortar utilizing the center cut approach. Only the center of the horizontal joints is cut with a rotary blade. Hand chisels are then utilized to remove mortar up to the brick or stone edge and at vertical joints. This technique ensures no overcutting or chipping of brick and stone units. On thin, butter joints, all mortar is removed by hand. We perform our repointing work using custom blended mortar that replicates the formulation, aggregate, and appearance (tooling profile) of the original. By replacing like with like, we ensure that the building continues to perform as it was originally intended. By far, the most damage caused to historic masonry is by applying modern mortars that are not compatible with the original materials. Mortars for repointing should be softer or more permeable than the masonry units and no harder or more impermeable than the historic mortar to prevent damage to the masonry units. It is a common error to assume that hardness or high strength is a measure of appropriateness, particularly for lime-based historic mortars. Stresses within a wall caused by expansion, contraction, moisture migration, or settlement must be accommodated in some manner; in a masonry wall, these stresses should be relieved by the mortar rather than by the masonry units. Permeability, or rate of vapor transmission, is critical. High lime mortars are more permeable than denser cement mortars. Historically, mortar acted as a bedding material—not unlike an expansion joint — rather than a “glue” for the masonry units, and moisture was able to migrate through the mortar joints rather than the masonry units. Marion, Inc’s repointing work is executed in accordance with the National Park Service’s Preservation Brief #2, “Repointing Mortar Joints in Historic Buildings.” In fact, staff within Marion and our sister company U.S. Heritage Group, Inc. drafted the revised version of this preservation standard. Joints are not limited simply to mortar. Control and skyward facing coping joints are primed, backer rod installed and filed with masonry sealant. We often finish our sealant joints with sand, when appropriate, to match the mortar joint. Lead and other metal joints are sometimes used for hard to reach areas such as the top of monuments skyward-facing coping, etc. Marion has extensive experience with these long-wearing joints, which often require metal cutting, bending, and soldering.